on this lake from one end to the other and really enjoyed it. There is a small Island on it named M & M Island – (more like a rock with some dirt on it) and it’s more than deep enough for dinghies with dagger boards. There is also a nice Waterfront Park (http://www.medical-lake.org) on the south west side with swim area and hiking trails. (I was surprised to see how much was available around a six acre lake.) 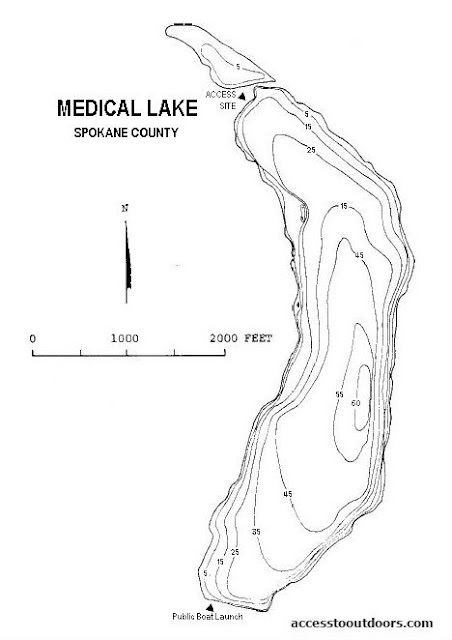 The city of Medical Lake is on the East shore which also has a nice park. I met a couple that own a house on Medical lake with a Hobie 16 catamaran sailboat on the beach, They indicated they sail the lake all the time and have great fun with winds that are very consistent throughout the year. The interesting thing about this lake is that it has a lot of trees around it and a big hill to the west but this hill and trees seem to not block the wind too much. Overall a nice lake to boat on and great to swim in, and I might add; it’s a NO-motor lake. Info: City & Park info http://www.medical-lake.org . Directions/Maps: Take Exit 270 off of I90 to Four Lakes city center on Highway 904. Turn right/west onto W Medical Lake/4 Lakes Rd. Follow this road that turns into E Lake Street when you enter the town of Medical Lake. This road T's into S Lefevre Street. If you turn left this road takes you to the boat launch and Waterfront Park. If you turn right it takes you to the Medical Lakes access park by turning off of this road left/west onto W Brooks Rd. When this road turns to the right drive a short distance and turn left/west onto W San Salvador Street to the access park, which you will see immediately at the lake. Maps: Printable lake map below. 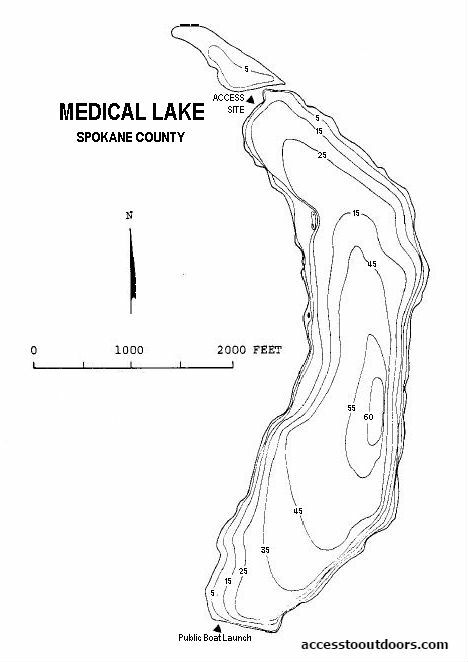 To view map visit google.com/maps type in Medical Lake, Spokane County, WA. This is an amazing park... beautiful. Has nice restrooms, swimming area, large lawn, paved and un-paved paths/trails, large beach area, shaded picnic areas, baseball field, etc. One could launch a non-motorized lightweight watercraft from or near the beach area if you find the boat launch to busy. However this park gets pretty busy particularly in the summer also. ACCESSIBILITY: PARKING... Large paved parking lots; PATHS/TRAILS... Paved accessible paths (does not go right to the water's edge; RESTROOMS/FACILITIES… Fully accessible restroom; SENSORY... No sensory tactile markers for those with visual and other impairments. DOCKS/LAUNCHES/PLATFORMS… No docks or launch but one could launch a non-motorized lightweight watercraft from or near the beach area; DIRECT WATER ACCESS… No access for wheeled mobility devices. Could access the water with assistance at the beach. As one progresses into the water getting stuck in the mud could be an issue; TRANSFER SYSTEMS... None; CAMPING... None; O.T.H.E.R… Oddities/Barriers: Nothing unusual; Terrain: Level to about 3% plus grades; H2O/Water: Water normally murky. Water temperature in the summer can be around 60 to 70 degree; Environmental Conditions: High winds and hot summer temperatures; Resources: Food, drinks, and gas in town of Medical Lake. ACCESSIBILITY: PARKING... Large gravel dirt combo parking lot; PATHS/TRAILS... Bike/Pedestrian Path near the parking lot. Does not give one access to the launch. A bumpy gravel road goes to the launch. With 5% plus grade; RESTROOMS/FACILITIES… Fully accessible restroom near by at Waterfront Park; SENSORY... No sensory tactile markers for those with visual and other impairments. DOCKS/LAUNCHES/PLATFORMS… One wide gravel rock combo single lane launch; DIRECT WATER ACCESS… No access for wheeled mobility devices; TRANSFER SYSTEMS... None; CAMPING... None; O.T.H.E.R… Oddities/Barriers: Nothing unusual; Terrain: Level to about 5% plus grades; H2O/Water: Water normally murky. 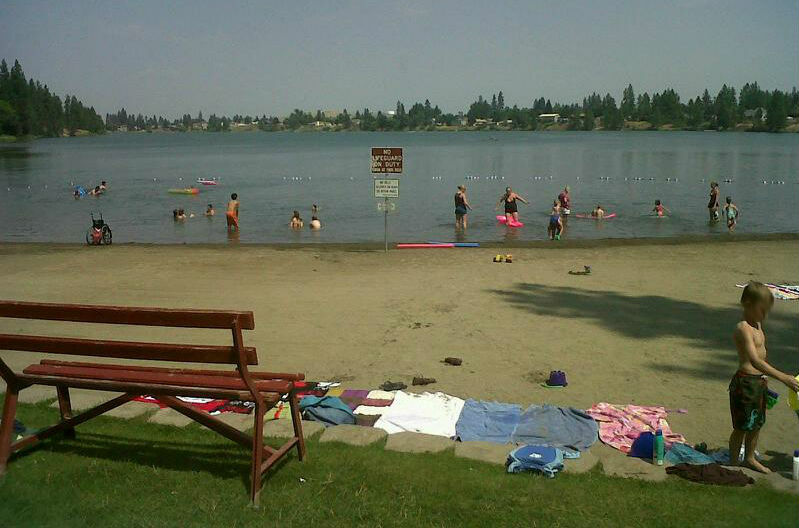 Water temperature in the summer can be around 60 to 70 degree; Environmental Conditions: High winds and hot summer temperatures; Resources: Food, drinks, and gas in town of Medical Lake. Nice waterfront park with restroom and large lawn and somewhat of a beach. Could launch a non-motorized lightweight watercraft off the beach. ACCESSIBILITY: PARKING... Small paved parking lot with two accessible designated spaces; PATHS/TRAILS... Paved parking lot. Large gradually sloping lawn of 3% grade; RESTROOMS/FACILITIES… Accessible restroom; SENSORY... No sensory tactile markers for those with visual and other impairments. DOCKS/LAUNCHES/PLATFORMS… None. Launch watercraft from lake beach; DIRECT WATER ACCESS… No access for wheeled mobility devices; TRANSFER SYSTEMS... None; CAMPING... None; O.T.H.E.R… Oddities/Barriers: Nothing unusual; Terrain: Level to about 3% grades; H2O/Water: Water normally murky. 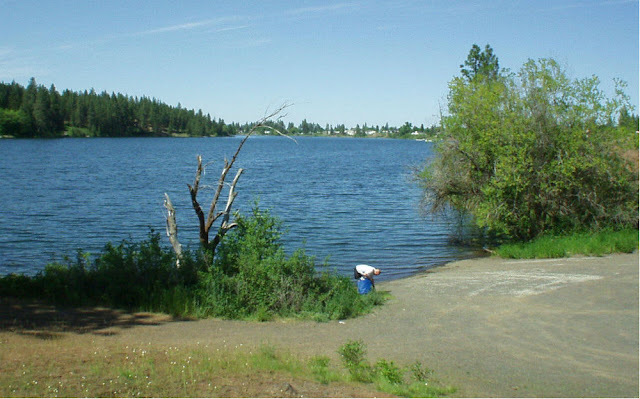 Water temperature in the summer can be around 60 to 70 degree; Environmental Conditions: High winds and hot summer temperatures; Resources: Food, drinks, and gas in town of Medical Lake. ACCESSIBILITY: PARKING... Gravel dirt combo parking lot; PATHS/TRAILS... None; RESTROOMS/FACILITIES… None; SENSORY... No sensory tactile markers for those with visual and other impairments. DOCKS/LAUNCHES/PLATFORMS… None. Launch watercraft from lake bank; DIRECT WATER ACCESS… No access for wheeled mobility devices; TRANSFER SYSTEMS... None; CAMPING... None; O.T.H.E.R… Oddities/Barriers: Nothing unusual; Terrain: Level to about 3% plus grades; H2O/Water: Water normally murky. Water temperature in the summer can be around 60 to 70 degree; Environmental Conditions: High winds and hot summer temperatures; Resources: Food, drinks, and gas in town of Medical Lake.